Inexpensive software and other tools, coupled with ubiquitous Internet access, have made it easier than ever for creative people to reach a large audience. Whether you are a writer, a podcaster, a video producer, a software developer, or a maker of some other description, distribution has been reduced to a mere implementation detail. Yet, with barriers to entry being lowered, this also means that it’s never been more difficult to make a living online. Right now, if you run a website, advertising rates are down while readers are blocking ads in ever-increasing numbers. Podcasters are doing better as sponsorship rates are superior to web ads, but it’s a relatively new medium dominated by a relatively small group of companies that sponsor the most popular shows. The resulting concentration makes many podcasts vulnerable to losing the majority of their income if a sponsor leaves. Meanwhile, app prices continue to race toward free on every platform. One of the keys to succeeding in any online market where supply outstrips demand, or where risk is concentrated, is to remain nimble and distribute the risk. People have experimented with all sorts of revenue models as a hedge against this uncertainty. Memberships and patronage systems are options that let “super fans” support work that they value more than others. But, there's another option you should consider that has a lower barrier to entry, the potential to reach a far wider audience, and once set up, works on autopilot, producing cash without any intervention by you and at no added cost to your audience – the iTunes Affiliate Program. In March, I launched an iOS app called Blink that makes it easy to create links for the iTunes Affiliate Program. I know writers, developers, and podcasters who have used the program successfully for years, but each had their own unique, quirky, and often fiddly solutions for generating links. I set out to streamline that process so they could concentrate on their craft instead of links. But, Blink is just a tool. It leverages Apple's iTunes Affiliate Program to help creative people build a sustainable business, but outside of a savvy core of people who recognize that the affiliate program helps them keep doing what they love, the program is still largely unknown. The purpose of this article is to fix that – to lay it all out comprehensively. There is a lot here on the program because who doesn't like a nerdy "deep dive" into almost anything? Don't let that intimidate you. At its core, the program is dead simple. There are tools, like mine, to make linking easier once you have signed up, but you don't need them to get started. 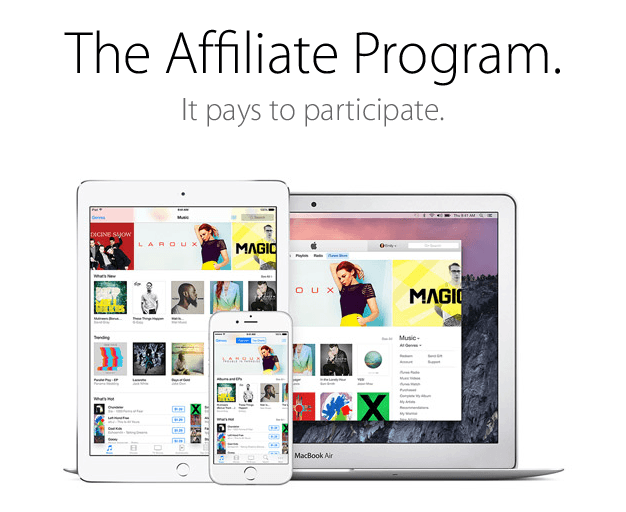 What is the iTunes Affiliate Program? Apple's devices are made more valuable to its customers by the media downloaded to them. The sign-up process is straightforward. You create a username, password, and provide contact information regarding yourself, your business, if applicable, and how you intend to use the iTunes Affiliate Program. It is worth noting that you must have an active website to be accepted into the iTunes Affiliate Program. Social media profile pages do not count. Without a website, your application will be rejected. The iTunes Affiliate Program is run for Apple by Performance Horizon Group (PHG). PHG reviews applications within about one week. If approved, you will receive an email with a link to log into the PHG Dashboard where you will find your affiliate token – the key to creating affiliate links. One of the first things you should do right after being accepted into the program is go to the Payments tab and add your banking information so that you can get paid the commissions you earn. The iTunes Store operates in 148 countries, so your affiliate links will generate income in multiple currencies. You need to add banking information for each currency in which you get paid, so check back periodically to see if you need to add banking information for additional currencies. Before I get into how to effectively create iTunes affiliate links and get paid, it helps to understand the components of an iTunes URL and the bits that are unique to affiliate linking. There is a lot going on in an affiliate link, so let’s break it down. This is straightforward. Every affiliate link to an Apple store has itunes.apple.com at its core. The geo prefix is a relatively new addition to iTunes URLs that mitigates the problem of regional restrictions. This is not a problem for links to apps or podcasts, but the geo prefix is particularly useful for music, TV, and movies. For reasons that are outside the scope of this article, music, TV, and movies are distributed geographically and are not always available at the same time in Apple stores for different countries. As a result, links to items in two stores in different countries often cannot be opened in both stores. For example, the link to the Arctic Monkeys album above is to the US iTunes Music Store and will not open in the UK store, even though the same album is available in both countries. The geo prefix fixes this. A URL with the geo prefix will redirect to the equivalent media in the store of your user's home country. Using the geo prefix maximizes your commission prospects by ensuring links that you create are available in as many of the 148 iTunes Stores as possible. Just after itunes.apple.com is a two character country code that determines which country's store people are sent to when they use your link. If you've used the geo prefix described above, users are sent to their local store. In my Arctic Monkeys example above, the country code is us, which is the code for the United States. The action gives you a hint about the category of media linked to, but only at the top level. For instance, you can tell from the app action that the media is software, but you cannot tell whether it is an iOS or Mac app. In the Arctic Monkeys example, the action is "album," but from that alone, you cannot tell if the link is to an album or an individual song. The description portion of an iTunes URL is optional. It can be deleted and your link will still work. The primary purpose of the description is to make it easier for people to identify what is being linked to. That way, if someone saves your link for later, the link itself identifies the linked item. In the example above, the description is whatever-people-say-i-am-thats, which is a truncated version of the Arctic Monkeys album name. The iTunes ID (id followed by a series of numbers) is one of the most important elements of an iTunes link. Each item sold in an iTunes Store has a unique iTunes ID, which is like a serial number. With little more than an iTunes ID, you can construct a link that will take users to the correct item in the store. The iTunes ID for the Arctic Monkeys album is id121522402. Every affiliate link must include a question mark character separating the main body of the URL from parameters like your affiliate token. The order in which your parameters appear after the question mark does not matter. Many links generated by iTunes already include a “?” because Apple often includes its own parameters. However, if you run across a link without a “?” and want to convert it into an affiliate link, it is crucial that it be added before appending your affiliate credentials. The identifier in this case is i=121522324. This is the money parameter. If you do not add your affiliate token to a link somewhere after the ?, your link will take people to the intended media, but you won’t earn a commission. Affiliate tokens are composed of two parts. The first part is a series of 1s and 0s that never start with a 0. The second part is a series of alphanumeric characters of varying length that is separated from the first part of the token by a lower case letter “L.” It’s important to recognize that this separator is a lowercase letter “L” because it can be easy to mistake it for a capital letter "I," a number 1, or a pipe “|” character. The affiliate token is preceded by at= in the full URL. In the Arctic Monkeys example, the affiliate token is 11lbfL and is preceded by &at= because it is not the first parameter in the link. Campaign tokens are optional. I discuss how to use them later, but from an implementation standpoint, they work just like affiliate tokens but are preceded by ct= instead of at=. Campaign tokens are limited to 40 contiguous characters. Don’t get fancy and try to use punctuation or other characters that could break your link. Stick to fewer than 40 alphanumeric characters and you will be fine.2 In the example above, the campaign token is blog and is preceded by &ct= because it is not the first parameter. This parameter is for app developers only. Apple's developer portal, iTunes Connect, includes analytics that help developers track additional data related to their apps. Each developer has a unique provider token that can be found in the App Analytics section of iTunes Connect. When added to an iTunes URL, a provider token enables analytics for those links from within iTunes Connect. The affiliate program for Apple Music is separate from the rest of the iTunes Affiliate Program and has a different commission structure, which I discuss in the Getting Paid section below. Also, it is important to note that although the libraries of music available in Apple Music and iTunes are both large, they differ. If you try to link to Apple Music and the music is not available, the link will default to the iTunes Music Store if the song or album is available there. For instance, Abbey Road by The Beatles is currently available in the US iTunes Music Store, but not Apple Music. If you take the iTunes Music Store link https://itunes.apple.com/us/album/abbey-road/id401186200 and append app=music in order to open the link in Apple Music, the link will not fail. Instead, the link will ignore the parameter you added and default back to the iTunes Music Store. The launch store parameter does exactly what you would expect – it launches the store to which you are linking. If you remove this parameter, users will get a web page preview of the media to which you linked, but the store won't open. Some people don’t like it when links launch iTunes, so you may want to exclude this parameter. Keep in mind, however, that removing ls=1 introduces a layer of friction between users and the store that will likely result in fewer sales on which you earn commissions. The unique origin parameter is also optional. It is added by Apple to certain URLs based on the source of the link. For instance, links generated by the iTunes Search API include a uo=4 parameter, which is the designation for that source. These parameters presumably give Apple insight about the use of the affiliate linking tools that it provides, but can be deleted without affecting the link. All right. 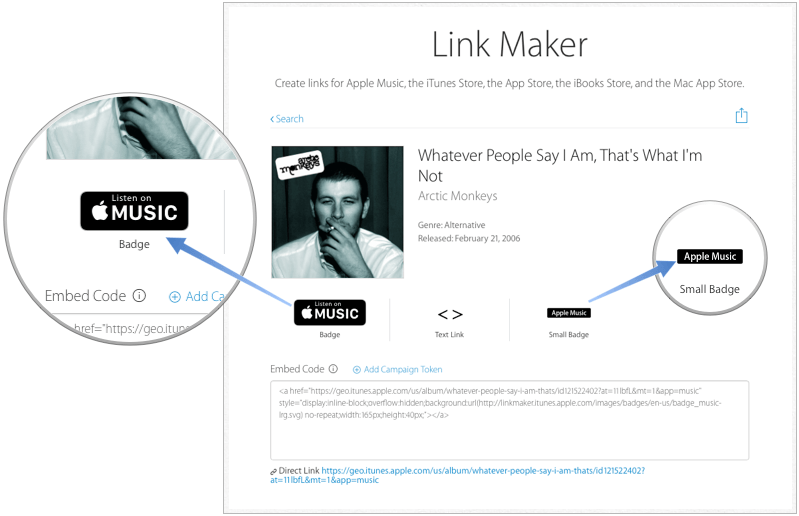 With the secrets of iTunes affiliate links unlocked, it's time to dive into the mechanics. With the exception of Apple Music, you earn 7% from purchases that result from your links, but there are a few details to keep in mind. Affiliate links are evergreen, but have a shelf life after they are clicked. Once published, a link can earn you commissions so long as the linked media remains available. This is one of the primary benefits of affiliate linking. If you have a large body of work online that contains affiliate links, the links can generate income with no additional work on your part. Your commission for any one sale may be small, but with many links and a sizable audience, you can take advantage of long tail economics. Commissions are earned only on purchases made within twenty-four hours of your affiliate link being clicked, or until the user clicks someone else’s affiliate link.4 I often get asked why I use affiliate links for free media. The answer lies in how the commission period works. Your links take users to specific media on an Apple store, but your commissions are not limited to that media. If someone clicks on a link to anything – free or not – you earn a commission on all purchases made from that device until the commission period expires. So, that link to your favorite free podcast could earn you a $10.50 commission if someone clicks on it and then buys the James Bond movie collection for $150 later that day. There are a few additional limitations worth noting. First, commissions are device-specific. If I use your affiliate link on my iPhone, but decide to wait until later to buy whatever you linked to on my iPad, you won’t earn a commission. You only get the commission if I tap your link and make a purchase on the same device. Second, you can earn commissions on in-app purchases, but only in-app purchases made within the app to which you link. In-app purchases made in other apps don't count. Finally, Apple Music links can have affiliate tokens appended to them just like any other URL. If an Apple Music affiliate link is used by someone during their 90-day free trial who continues as a paid Apple Music customer for at least a month thereafter, you earn a one time commission that varies in amount by country. For instance, the commission for US linkers is $5.00. Keep in mind, however, that the Apple Music affiliate program is separate from the iTunes Affiliate Program, which means that other purchases made in an Apple store within twenty-four hours of using an Apple Music affiliate link will not earn you a commission on those purchases. Testing links is simple. Once you have created a link, open the PHG Dashboard. In the bottom left corner of the page is a gauge. The needle on the gauge will register clicks on your affiliate link in near real-time. So, with the gauge showing in your browser window, click your link and see if it registers. If your click doesn't register, go back and check that you haven't made any mistakes in formulating your link. Tracking your affiliate link statistics is done exclusively through PHG. You can visit PHG's website or use its native iOS app, ExactView, to track your links. 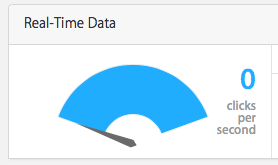 From the PHG Dashboard or app, you can check aggregate link performance. The information you receive is not user-specific, so user privacy is maintained. The PHG Dashboard also includes an overview that lets you view clicks, items downloaded, commissions earned, revenue generated, and earnings per click over various time periods that you can specify. You can break down each of the former by Top 5 Countries, Top 5 Products, and Top 5 Campaigns. A separate Reporting tab on the PHG website lets you create reports using many of the same metrics discussed above. The web-based tools from Apple that I discuss below can also be accessed via PHG's website with the added advantage that if you are logged in, accessing Apple's tools from the Tools tab will auto-populate the links you create with your affiliate token. Like I mentioned earlier, PHG has an iOS app called ExactView that provides a limited subset of the information available on their website. The design of ExactView is sub-par, and because the PHG website features a responsive design, I prefer to track affiliate link statistics using Safari. The PHG Dashboard has a payment tab you can use to set up payment details for your affiliate account and view reports of past payments made to you. Commissions are paid in the currency of the store where items are purchased. To get paid in your local currency, you need to add payment details for each currency in which you receive commissions. Do not put off doing this because if you have commissions in your account for 18 months after you are eligible to be paid and have not provided proper banking information, PHG reserves the right to keep your commissions for their own use. Commissions are eligible for payment 90 days after they are earned, provided you have met the payment threshold. Although PHG lets you set any payment threshold you want, they will not pay you until you meet its minimum payment threshold, which is $30 in the US, £20 in the UK, and €30 in the rest of Europe. There are different minimum payment thresholds for other countries, and PHG will provide a payment threshold schedule on request if you choose to be paid in a different currency. Who is Affiliate Linking For? Affiliate linking works at any scale, so it really is for anyone. That said, Apple does impose restrictions on who they will accept into the program. The primary requirement is that you must have an active website that does not contain objectionable content. A Twitter account or other social media presence is not sufficient. After you are accepted into the iTunes Affiliate Program, there is, however, no limit on where you may post affiliate links. You can post links on your website, but also on social media, in emails to friends and family, and really anywhere else you would like, which is why the website requirement is something I would like to see Apple reconsider. It strikes me as old-fashioned thinking. Many people have a large social media presence, whether on Twitter, Facebook, or some other service, and could generate substantial iTunes traffic even without a website. I see no compelling reason why affiliate linking should be limited to website owners, especially since you can post to social media once accepted into the program. The only limit on use cases for the iTunes Affiliate Program is your imagination. If you have ever shared a link to media sold in any of Apple's stores, the affiliate program is, at a minimum, a good way to supplement your income, but it can also form the basis for an entire business. To illustrate the breadth of business that can benefit from the iTunes Affiliate Program, I will focus on three specific use cases – developers, podcasters, and writers. Seriously, you have no excuse if you are not using affiliate links and sell your software through the iOS or Mac App Stores. You should already have a website that promotes your app, and every link on it should be an affiliate link. Apple takes a 30% cut of the revenue generated by your apps. Affiliate linking lets you change that split to 77/23 for links clicked on your website. Most people who visit your site got there because they are already interested in your app. It is just one data point, but over the course of 2015, I have seen a conversion rate of around 11% on the affiliate links embedded on squibner.com – orders of magnitude higher than links I have posted elsewhere. This is the closest thing to a cash-in-hand customer you will likely find anywhere online, and you can increase what you make from them without asking for more money – the affiliate commission comes out of Apple's revenue. While you are adding your affiliate credentials to your app links, consider adding Smart App Banners for each of your apps as well. These can include affiliate credentials so that when someone visits your app's page on an iOS device, they are presented with your app icon and the ability to go straight to the App Store to buy it. Adding Smart App Banners is very easy. David Smith has a great how-to from 2012 on his website on this. The one thing that has changed since David's post is how affiliate credentials are added to the affiliate-data field. Under the current affiliate program, it looks something like this: affiliate-data=pt=14993&at=11lbfL&ct=blinkpage. Only the at= portion is mandatory if you want to earn an affiliate commission from the link. Many podcasts generate no revenue at all. Others rely on sponsorships or patronage models. And while podcasts are not terribly expensive to make, they do have costs. Whether you are looking for a way to cover your costs or diversify your sources of revenue, the iTunes Affiliate Program is a good option if you ever discuss iTunes media on your show. Podcasting might not jump immediately to mind as a format for affiliate linking because it's audio, but podcasts usually include show notes containing links relevant to an episode. Show notes are available from within most podcast players, including Apple's own. Affiliate linking in show notes is already used by many podcasts, including those on networks like Relay FM, esn.fm, and 5by5.tv. Especially if you are starting out in podcasting and do not yet have an audience large enough to attract sponsorships, affiliate linking can help you start covering costs like hosting. Podcasting is uniquely personal. When a good podcast host recommends an app or movie, it's like the recommendation is coming from a close friend. Consequently, the conversion rates for affiliate links can be quite high. Podcasts command higher advertising rates than traditional web advertisements for this very reason, but the number of sponsorships that you can reasonably include in a single podcast episode is limited, which sets a ceiling on the revenue any one episode can generate. Using affiliate links in show notes is a great way to generate additional revenue that does not interrupt the flow of a podcast the way a sponsorship can. Writers who publish online are a natural fit for the iTunes Affiliate Program. Unlike traditional web advertising that can get in the way of the reading experience, affiliate linking enhances it. If your readers read about an app, movie, book, or other media that is available on one of Apple's stores, providing a link that readers can use and that earns you a commission is far less intrusive than, and reduces your dependence on, advertising revenue. Plus, the evergreen nature of affiliate links means that your links will continue to earn you money long after your article has been published. Conversion rates for affiliate links vary widely depending on the type of site, how topical or "evergreen" the content is, and other factors. Writers I have spoken to don't use affiliate linking as their sole source of income, but many get conversion rates approaching 20%, which, for a site with significant traffic, can add up to a sizable chunk of the overall revenue generated by their site. Don't forget that if the link you copy does not include a ?, you must add that instead of appending your affiliate token with an ampersand. That's really all there is to it. If all you do is append your affiliate token to iTunes URLs, you will start earning commissions as soon as people start clicking them and making purchases. However, with a campaign token, you can differentiate one URL from another to track their performance separately. For instance, you might be a developer who wants to track the performance of links for each of your apps separately. Or, perhaps you are a podcaster and want to track links by episode of your podcast. There really is no right or wrong way to use campaign tokens, and the only limit is the technical one that they be forty or fewer characters in length. Developers can also add a provider token to their URLs so they can track the performance of links to their own apps in iTunes Connect's App Analytics, but that is by no means required. So, at its most basic, affiliate linking is relatively simple, but once you start using multiple campaign tokens, provider tokens, or multiple affiliate accounts for different projects, generating links by hand quickly becomes a tedious chore. Of course, you could type them out like an animal, but you’re better than that. Whether you favor Mac or iOS, native or web, there’s a tool out there that will make your new affiliate linking lifestyle easier. Apple provides several web-based tools for linking to iTunes content that can be accessed from the Affiliates Linking Tools page. Link Maker lets you search for content across all of the iTunes stores. In the bottom right corner of the Link Maker page is a blue icon with two interlocking links that form an x.
Clicking that icon opens a popup into which you can type your affiliate token. By doing so, the links and HTML you generate by Link Maker will include your affiliate credentials automatically. Widget Builder lets you create a variety of custom widgets to showcase media or let users search for content. 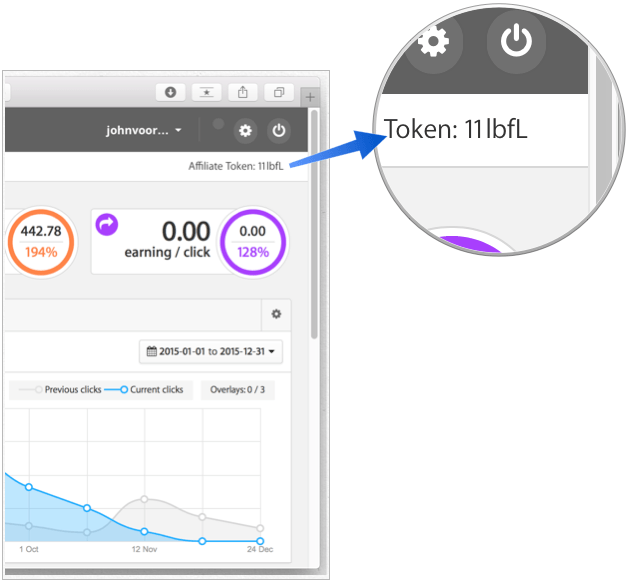 Adding your affiliate tokens is not as easy in Widget Builder as with Link Maker. Instead of entering your affiliate token once on the web page so that it is automatically inserted in the generated links, Widget Builder requires you to find the at= parameter in the HTML it generates and add it by hand. Once you are done, you simply copy the HTML, drop it into a website, and your widget is displayed in a separate iframe. One additional downside of widgets is that their design has not been updated to match OS X or iOS's current design, so they look a bit dated to anyone familiar with Apple's current design language. A separate Apple Music Playlist Widget maker allows you to make Apple Music playlist widgets. 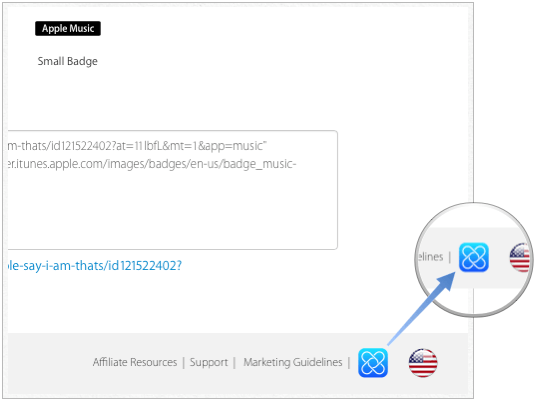 Unlike Widget Builder, you can generate playlist widgets that automatically include your affiliate credentials by using the blue link icon described above in the Link Maker section. If you are a TextExpander user, you might want to consider a snippet that expands into &at=*myAffiliateToken* to save yourself the need to memorize your affiliate token. Alternatively, try Dr. Drang’s command line script that can convert an iTunes URL into the HTML necessary to create a website sidebar feature. With Keyboard Maestro, you can assign actions to keyboard shortcuts on your Mac. After you set up a macro, Keyboard Maestro can automatically modify the iTunes URLs in a document to append your affiliate credentials. Keyboard Maestro is available directly from Stairways Software for $36. Brett Terpstra makes three free Mac service utilities that incorporate affiliate linking. SearchLink is a Mac service that can take selected text, run various searches with it, and return a standard Markdown link. Among other sources, SearchLink can search the iTunes, Mac, and iOS App Stores and return links to media with your affiliate credentials already appended. Affiliatize is another Mac system service from Brett that is a variant of his Titler service. Affiliatize automatically converts selected iTunes links into affiliate links after a one-time setup of your affiliate credentials. Bitlyize does the same thing as Affiliatize, but also converts the affiliate links that it generates into bit.ly short URLs. These services work well, but do require editing of hidden files on your Mac to input your affiliate credentials, which may be more fiddly than some users would prefer. Affiliate is a menu bar app for Mac that intercepts copied iTunes links, automatically appends your affiliate credentials to them, and then places them on the clipboard. I personally do not like this option primarily because it cannot manage multiple affiliate tokens, but if your needs are simple, Affiliate is worth looking at and is only $0.99 on the Mac App Store. Blink is an iOS app that I created to simplify the affiliate linking process on iOS. Blink automates the process by storing your affiliate credentials in its settings and allowing you to search all of the media offered by Apple across 148 countries in one place. Once you have saved your affiliate credentials and other preferences in Blink, you can generate plain or Markdown-styled links. Blink also includes an action extension that automates the conversion of links that you find in other apps, like Apple's iOS App Store app, the iTunes Store app, or third-party apps like Twitter clients. Blink is available on the App Store for $4.99. Workflow is a great iOS app for automating all sorts of things on your iPhone or iPad. It can be used in much the same way as TextExpander on the Mac, appending your affiliate credentials to the end of an iTunes link. Workflow does not give you the same degree of control and customization as Blink, but it is a solid choice if you are familiar with setting up workflows. If not, Adam Swiden has a great how-to on his website. Workflow is available on the App Store for $3.99. Editorial is a powerful iOS text editor with Python scripting built in. Using Editorial, you can run a Python script written by Dr. Drang and modified by Federico Viticci to append your affiliate token to an iTunes URL copied from the iTunes or App Store. Editorial is available on the App Store for $9.99. Sustainability is one of the biggest challenges facing anyone trying to run an online business of any description. There isn't one path to success, but putting all of your eggs in one basket and hoping for the best certainly doesn't work. Constant change is the norm. What works today may not tomorrow, which makes growing your business difficult, but also exciting. The iTunes Affiliate Program is not a silver bullet, but the beauty of the program is that it is simple at heart both conceptually and in its implementation. Take fifteen minutes to sign up, and once you have your affiliate token, start pasting it at the end of every iTunes URL you post. Look at a few of the tools that are available. Try a couple out and see how they fit into your workflow. Before long, generating affiliate links will become how you generate all iTunes URLs, and your links will be working for you and earning you money.